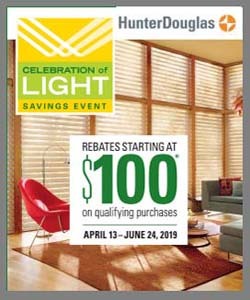 At Window Treats here in Holmdel, we carry the full line of Hunter Douglas window fashions and can meet just about any window treatment need—whether you need something for a bedroom, a bathroom, or a basement, we’ve got you covered. We can handle small windows, large windows, and out-of-the way windows. And we can handle odd-shaped windows as well! If you are looking for something to cover a window, speak with one of our trained consultants today. We’ll be happy to help you find the solution that fits your needs, style, and budget. Our professional staff can show you an array of styles, colors, and options that will not only take care of your needs but stay within your budget as well. Angles, Arches, Circles, and more. These windows draw the eye draw because of the unique shape and light each provides. Our favorite window coverings for these shapes include Pirouette® Window Shadings, NewStyle® Hybrid Shutters. Skylights. Skylights add light from above and provide a beautiful shower of light into any room. The honeycomb shade is a great choice for skylights and offers both blackout and light-filtering options. 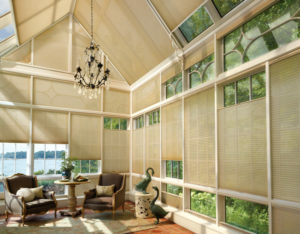 We recommend Duette® Honeycomb Shades. Bay, Bow, and Corner Windows. Bay, bow, and corner windows turn a flat, unassuming wall into a striking architectural statement. Some of the best choices for these windows include Provenance® Woven Woods, Vignette® Modern Roman Shades, Silhouette® Window Shadings, and Pirouette® Window Shadings.